Read the report in PDF form. • Twenty states have gone a decade or more without an increase in their gas tax rate. • Fifteen states have gone two decades or more without a gas tax increase. (1) For a more in-depth discussion of this issue, see Institute on Taxation and Economic Policy. Building a Better Gas Tax. December 2011. Available at: https://itep.org/bettergastax/. (2) Institute on Taxation and Economic Policy. 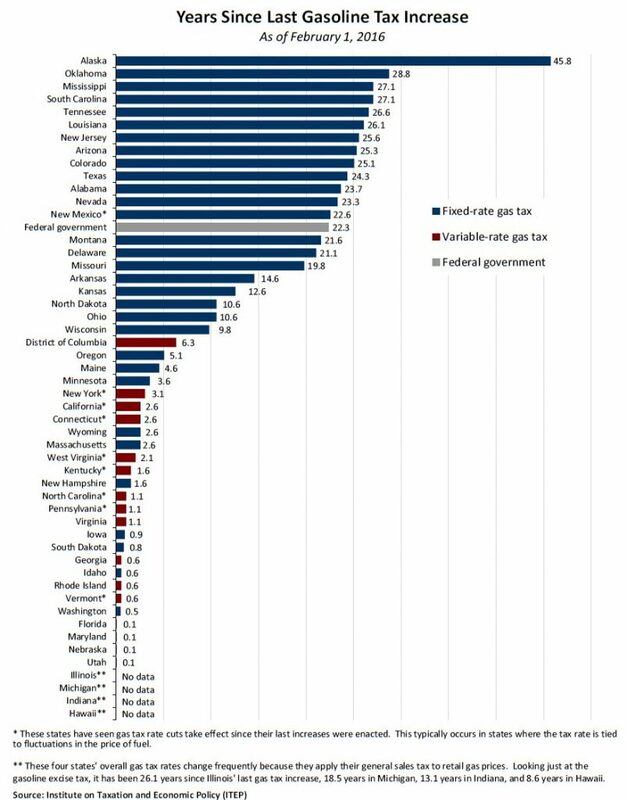 Most Americans Live in States with Variable-Rate Gas Taxes. February 2016. Available at: https://itep.org/wp-content/uploads/variablerategastax0216-1492632816.pdf. (3) These figures rely on the date that each gasoline tax increase actually took effect, as opposed to the date on which it was signed into law. Furthermore, this analysis does not include the years elapsed since Hawaii, Illinois, Indiana, and Michigan last raised their gasoline excise taxes because each of these states applies its general sales tax to purchases of gasoline and therefore sees frequent changes in its overall tax rate on gasoline. If these states were included, Illinois would join the list of states having gone two decades or more (26.1 years) while Michigan (18.5 years) and Indiana (13.1 years) would join those states having gone one decade or more. Hawaii (8.6 years) is the state in this group to have most recently increased its gasoline excise tax.